Hurricane Joaquin is shown off the Bahamas, Sept. 30, 2015. The U.S. National Hurricane Center said Hurricane Joaquin is headed toward the Bahamas with powerful winds and torrential rain. Hurricane Joaquin strengthened to "an extremely dangerous" Category 4 storm as it passed over the Bahamas Thursday, the U.S. National Hurricane Center said. Joaquin, with sustained winds of 209 kph (130 mph), caused heavy rains, minor flooding and a significant storm surge as it approached the lightly populated central and eastern islands. There were no immediate reports of casualties, said Capt. Stephen Russell, director of the Bahamas National Emergency Management Agency. It is the third hurricane of the 2015 Atlantic season. 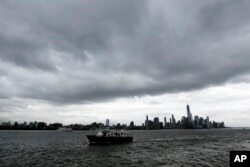 U.S. officials in states along the East Coast began preparations for the storm, which could possibly make landfall early next week, nearly three years after Superstorm Sandy devastated New York and New Jersey, killing more than 120 people and causing about $70 billion in property damage. Perry Williams, 47, left, and Alaric Nixon, 28, place sandbags on the storefront of Diamond's International store, in preparation for the arrival of hurricane Joaquin in Nassau, Bahamas, Oct. 1, 2015. The U.S. National Hurricane Center (NHC) in Miami said Hurricane Joaquin would batter the central Bahamas with wind and rain through Thursday night, adding that San Salvador, Cat Island and Rum Cay were expected to experience the most significant effects before the storm shifts northward, toward the United States. Residents on those islands were boarding up homes and businesses, and stocking up on food and drink. Forecasters predicted storm surges of 1.5 to 3 meters (5 to 10 feet) in the central Bahamas, with up to 51 centimeters (20 inches) of rain in some areas. This satellite image taken Oct. 1, 2015, at 9:37 a.m. EDT, and released by the National Oceanic and Atmospheric Administration (NOAA), shows Hurricane Joaquin. 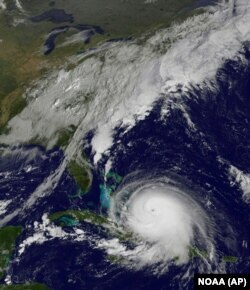 The Category 4 hurricane pounded lightly populated islands of the eastern Bahamas Thursday. Meteorologists say Hurricane Joaquin is pairing with an extraordinarily heavy rainstorm that is already drenching the southern East Coast. David Novak, director of the National Oceanic and Atmospheric Administration's Weather Prediction Center in College Park, Maryland, said the heavy rainstorm affecting the U.S. is a strange combination of conditions he hasn't seen before. It's a low-pressure system 10,000 to 12,000 feet high that is unusual and deep for this time of year. And it's not moving anywhere, so it can keep on dumping rain. The low-pressure system stretches from Florida to Canada on the weather map, resembling a giant hockey stick. That makes Hurricane Joaquin the puck. Joaquin's track after the Bahamas is difficult to forecast. But at least one computer model has it going straight into the Chesapeake Bay of Virginia and Maryland Sunday and Monday as a Category 2 storm, which would be bad news for such major inland cities as Washington, Baltimore and Philadelphia. A boat passes Pier A Park on the Hudson River with the New York skyline in the background, Sept. 30, 2015. Officials along the Eastern Seaboard are taking precautions for the rest of the week as forecasters closely follow Hurricane Joaquin. "Residents of the Carolinas north should be paying attention and monitoring the storm. There's no question," said Eric Blake, a hurricane specialist with the center​. "The worst-case scenarios are very worrisome, and the best-case scenario is pretty bad even without a landfall because of the rain threat," said Marshall Shepherd, a University of Georgia meteorology professor and host of the TV show Weather Geeks. Separately, a low-pressure system stalled over the Eastern Seaboard is forecast to drench coastal cites Thursday and Friday with several centimeters of rain. The rain led to flooding in South Carolina, where one woman died when her car was submerged in a flash flood, officials said. Some material for this report came from AP and Reuters.